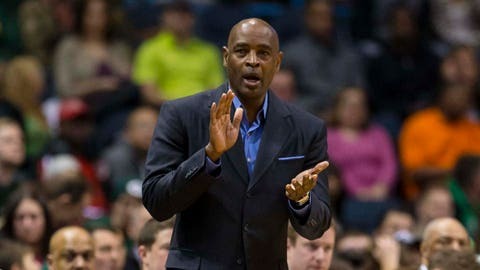 Milwaukee coach Larry Drew was disappointed with his team and himself after possibly their worst effort of the year. MILWAUKEE — In a season filled with poor performances, the Milwaukee Bucks may have put forth their worst effort of the year Saturday night in a blowout home loss to Atlanta. As agitated as he’s been in what’s been a very trying season, Bucks coach Larry Drew held a 20-minute locker room meeting with his team after falling 112-87 to a Hawks team missing a couple of key players. "This was just a totally, totally unacceptable performance," Drew said. "Here we are in the situation that we are in and my biggest concern is do we have still have any fire in the belly? That’s my biggest concern. Do we have anything inside that will allow us to go out and compete at a high level?" The Bucks certainly didn’t have any fire Saturday night, falling behind by 34 points and folding in front of their home crowd. It was an embarrassing performance to drop Milwaukee’s record to 8-35 on the season. "I’m disappointed in everybody, myself included," Drew said. "We are just not playing hard enough. I don’t care what the situation is. Again, with me included, we’re paid to play hard. I’m paid to coach this team to the best of my ability and get these guys ready to play. This is not a time to make up excuses for what has happened. "The situation is what it is. I told the guys after the game, it’s beyond basketball now. It’s about going out there and representing what’s on your chest and what’s on your back. That’s the attitude we have to bring every single night we play. Forget the record, this is about going out and competing every night." The first-year Bucks coach was asked if he saw any of his players that weren’t giving effort. "I saw times where possessions were taken off," Drew said. "I don’t care what the situation is from a wins and losses standpoint, guys are being paid to play hard. We didn’t play hard. When you play against teams that play hard, you have to play harder. We didn’t play hard. Disappointment didn’t stop with Drew, as the players in the locker room were looking at themselves to figure things out. "We just had a lack of energy, lack of commitment in the game," Bucks guard Brandon Knight said. "That’s what happens when you come out (like that) in the NBA. They had a lot of great players out, but that’s still an NBA team. I think we let our guard down. We have to be better than that." Knight was then asked what he meant by a lack of commitment of the game and he gave a very good answer. "At any point in the season. Effort is just for the love of the game. We have to love what we do no matter what our record is. We have to love the position we are in. Not everybody has the opportunity to play at this level. We have to take advantage of it. It can come and it can go quickly. When I say lack of commitment, I just mean just playing hard and cherishing the game that’s paved the way." Drew again threatened changes, saying he’s going to have to go with players who play hard. But at this point it’s unclear if there is such a lineup. He’s changed the lineup quite a few times and had 19 different starting lineups, but said it would be the "biggest cop-out ever" if the players used that as an excuse. "I don’t care which lineup I put out there, I want them to compete," Drew said. "I want them to compete and I want them to compete at a high level." Like Drew, Knight wants the team to throw their record out of the window and simply compete when they take the floor. He was one of the few players that left it on the court Saturday, scoring 27 point on 11-of-15 shooting. "The way things have been going, it’s easy to fall into bad habits," Knight said. "It’s easy to start doing things the wrong way. I think he just had to make a comment about it and really get guys thinking as individuals so we don’t fall into those bad habits. We’re always trying to build the right habits and trying to build so if you don’t see the results now you see them eventually. You can’t get there with bad habits. "I can get frustrated at times as well, but my frustration comes from the joy of winning and hating to lose. I’m just trying to make sure everyone stays positive and we’re building the right habits. If we’re down by 30, making sure we are playing the right way." 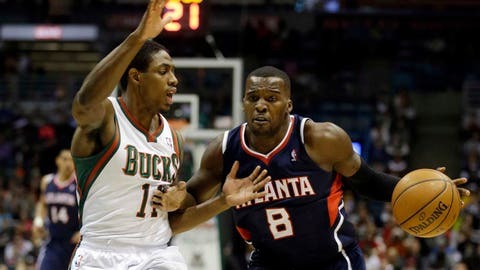 The Bucks better bring something more Monday against the Clippers, a much better team than Atlanta. If not, another poor effort will result in an even uglier result. "We can’t play like this on Monday or it will be worse," Bucks forward John Henson said. "That’s kind of our mindset right now. "I think everybody is searching for something to put that fire in us. I think at the end of the day it’s on us and we have to play that way."